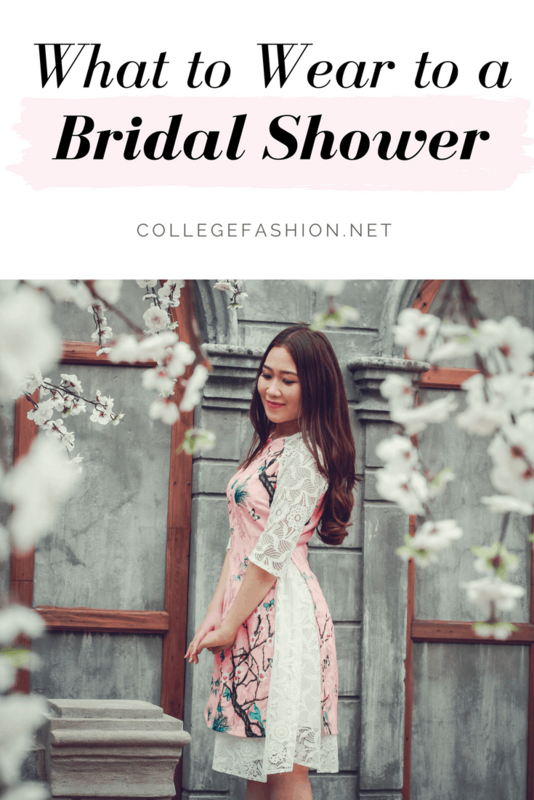 Here are some bridal shower outfits to give you some inspo for your next shower – or any family-friendly function you might have coming up! Chances are you’ll attend quite a few of these during your time in college and even more of them in the years beyond. 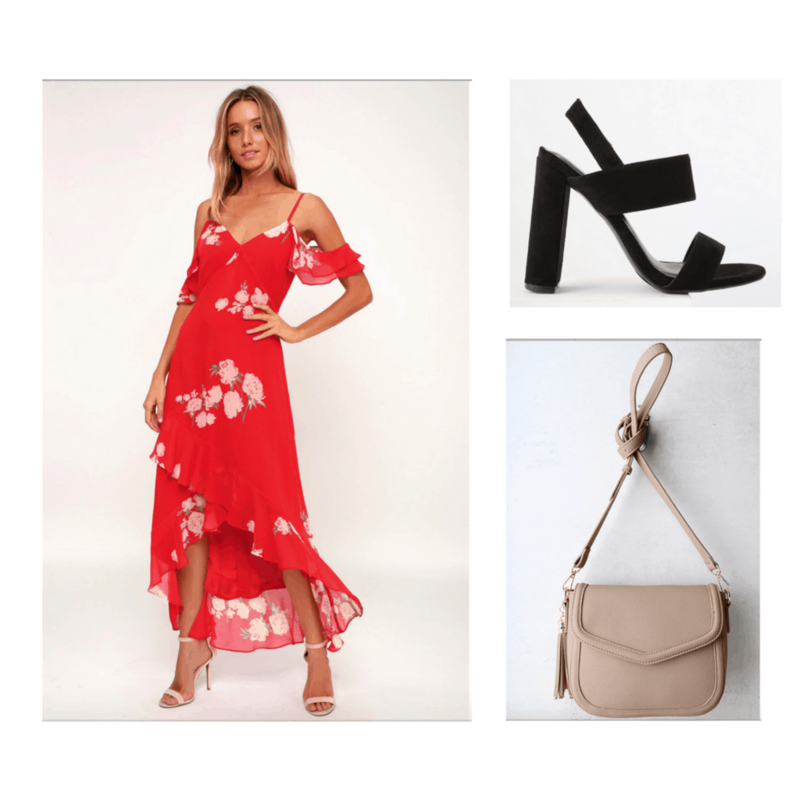 Here, I’ve attached five bridal shower outfits to spark some inspiration for what to wear to these events so you’re not stuck wearing the same maxi dress to every party! This bridal shower outfit is a simple go-to look you can wear for tons of occasions. 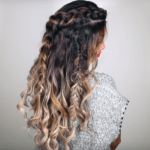 It has a mature, put together feel to it while staying fun and stylish. A good pair of block heels should be in every college girl’s wardrobe because they’re super functional, easy to walk in, and match almost any outfit. I love them here with a jumpsuit and statement earrings. 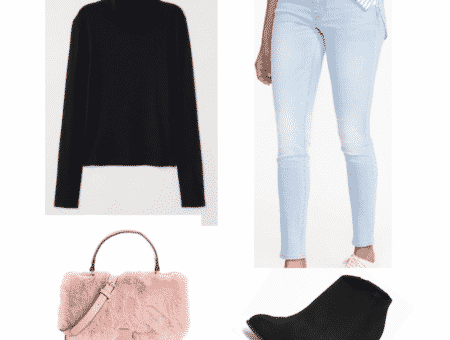 This outfit features items all from Lulus (unintentionally!) but it’s such a great site to find some really awesome pieces for every day and more special occasions. This look is very bright and fun, but is balanced by the neutral pieces, namely the tan bag and strappy black heels. 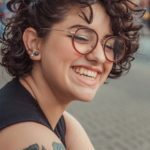 Feel free to add your personal flair with some gold jewelry! 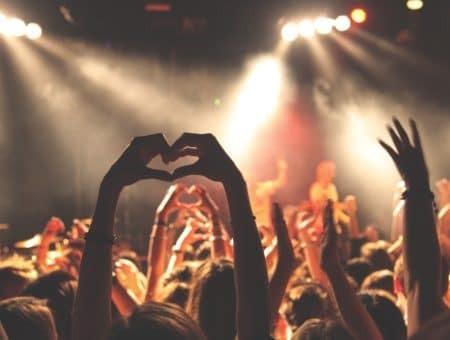 Bridal showers don’t necessarily require you to wear a dress or heels, it’s really dependent on the venue and family/friend group in attendance. I’ve been to fancier showers held at restaurants that were rented out and I’ve been to showers that were held at someone’s house – both were just as fun! This outfit has a much more laid back vibe than the first two, perfect for either style event. 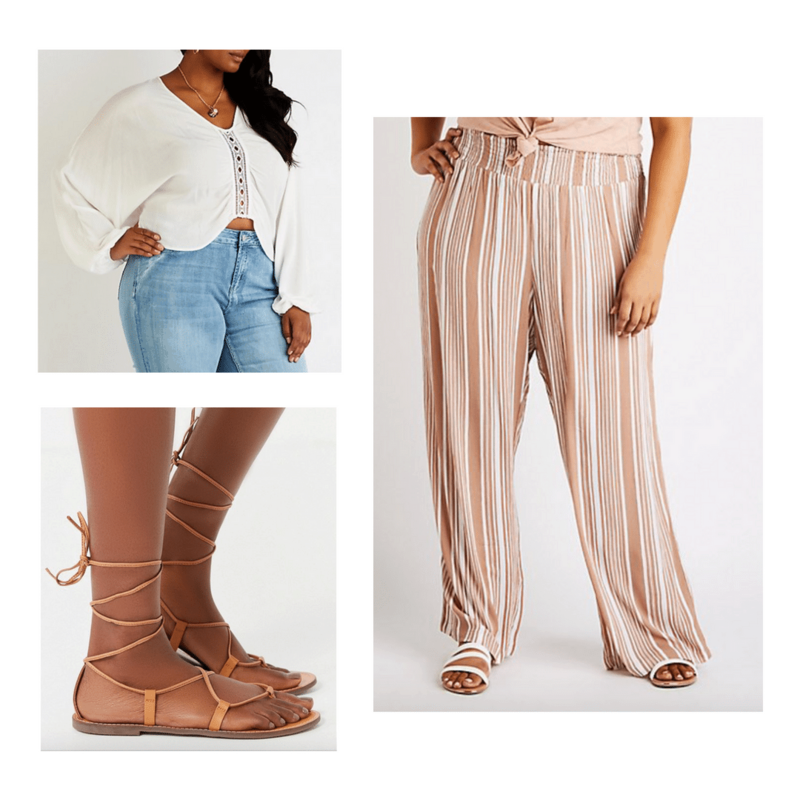 The palazzo pants are a must-have, they’re not only really stylish but also incredibly comfortable. This bridal shower outfit is my personal favorite of the bunch. It has a light, flowy feel to it but with a cool girl touch. 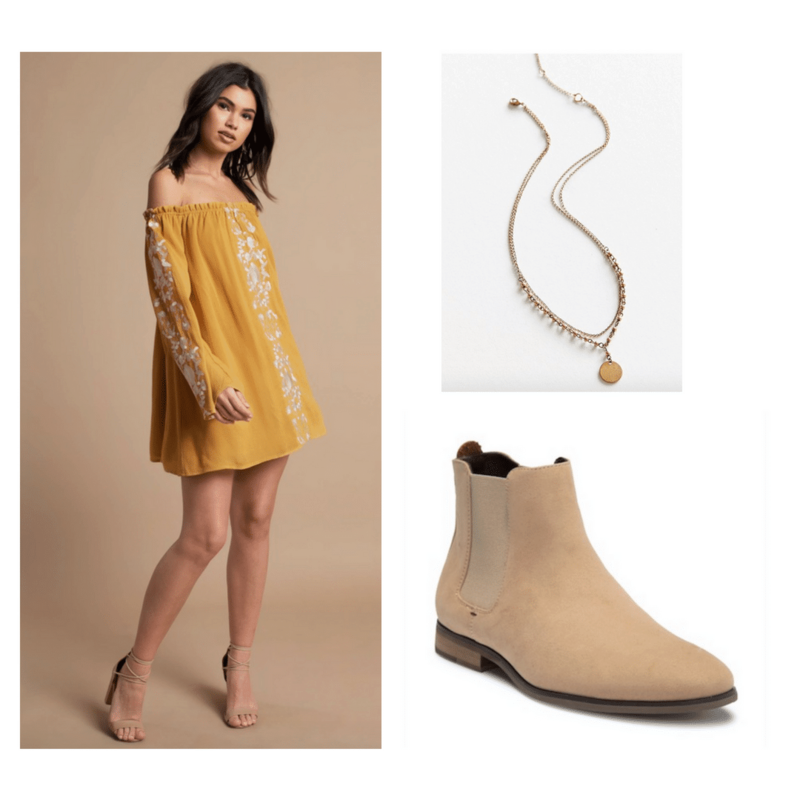 The yellow dress is super on-trend right now and the boots bring a more structured look to the ensemble. The gold jewelry accents the mustard color well, but feel free to add a pop of turquoise for extra color if desired! As I wrote before, showers don’t always denote a formal dress code, it really depends on the party. Check with the bride or bridal party if you’re unsure, but typically events like these are intended to be fun and easygoing. If you want to wear a dress, you can, and same goes for jeans and a cute top. This outfit is really casual and cool and works for an elevated everyday look. The off-the-shoulder ruffle top dresses up the jeans a bit more, and classic white sneakers look great with anything! Do you have any bridal showers coming up? When planning an outfit for any occasion it’s important to remember to have fun with it and let your individual style shine through! If you have any bridal showers coming up, I’d love to hear what you’re planning to wear, or if you’ve attended one recently, what did you go with outfit-wise? Tell us in a comment.